If you’re looking to make the move from your home to a senior community, you want to find the right place to call home. With various terms used to describe these communities, it can be difficult to understand which one best fits your needs. Here is a look at the differences between two of the most popular options: assisted living and nursing homes. An assisted living community provides a residence for people who are still active and independent. They offer rooms, apartments and even single-family homes for people in a communal area. These centers provide assistance with meals, transportation, laundry, wellness programs and offer opportunities for socialization. The meals are designed to be nutritious, meeting the health needs of retired people as well as those with special dietary restrictions. Some of these communities also provide medication reminders and other personal assistance. Staff may check on residents and help them with some basic tasks like dressing and bathing. There may even be a nurse on staff for periodic care and to answer medical questions that don’t require the specialized knowledge of a doctor. 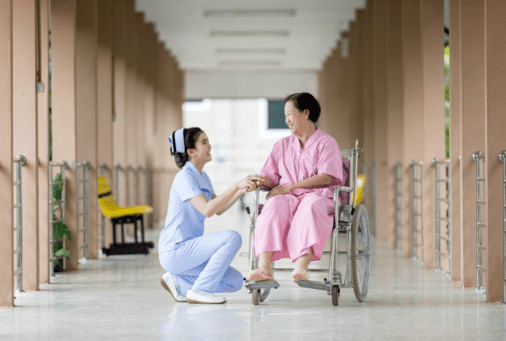 A nursing home provides continual care 24 hours a day for residents. They often need daily assistance with basic personal care, such as bathing, dressing and eating. They may be unable to walk or get up without help. In addition, nurses on staff provide medical care. To be eligible for a nursing home, a person must have a physical or mental health issue that leaves them unable to care for themselves. For many, it is simply a decline in health due to age or to a condition like Alzheimer’s. Nursing homes often offer activities and special events for their residents who are able to leave their beds and socialize. They may provide physical therapy and other programs to help improve the health of the residents. Many times, a doctor will visit the patients if they are unable to travel to a clinic or physician’s office. While the differences between the two communities may make it obvious which one is right for you, you must still consider the future. Will you be able to move from one aspect of senior care to the next level of care? Does the community provide the amenities you need? For instance, Daystar offers assisted living with weekly housekeeping, laundry service, three meals and an evening snack and much more. We even offer customized assisted living services to meet your needs. It can be difficult to think about change, especially in regards to your own future. However, it’s important to be realistic about your current needs and what may be necessary down the road. Once you understand what an assisted living community and nursing home have to offer, you can make the right decision for your own care.